openSAFETY is simply implemented on top of POWERLINK as well, with no impact at all on that base protocol. POWERLINK provides full-fledged cross-traffic. openSAFETY uses this function to achieve extremely brief safe reaction times. All communication for initializing and parameterizing the system goes through POWERLINK’s asynchronous communication channel. Sample safe POWERLINK network; generally speaking, all conceivable topologies are possible! 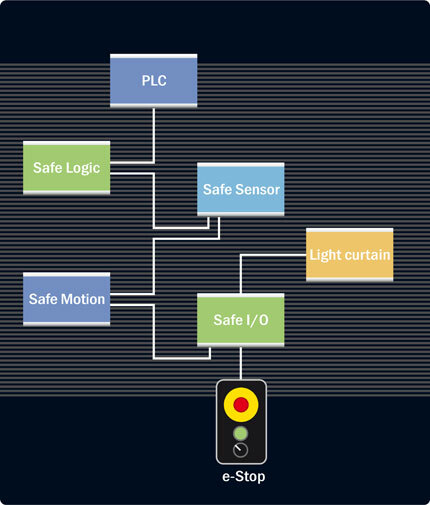 All of openSAFETY’s mechanisms, functions, and potential options are described in the openSAFETY over POWERLINK specification.